Paypal sent for the strut bars and c pillar bar. Awaiting confirmation. Will be making a rather large update within the next two weeks. Got a ton of additional items to list with the next few days. Broadway mirror, slip on style? Picture of the back, think it was the 280mm convex. Broadway mirror are slip-on style. I'll confirm if I still have the 280mm convex. Will be reorganizing and updating this with a ton of pictures this coming weekend. do you have an automatic driver side s13 hatch door panel? and broadway mirrors and gauges? Door panels, I have a good clean pair. Broadway mirrors are still available. Gauges, I will be listing some soon. how much for the RPF1s shipped to 10567? Will be adding parts within the next few days. Adding more items this weekend. Do you have pictures of the Silvia bumper? Will be adding more parts next week. Will be adding more items later this week. 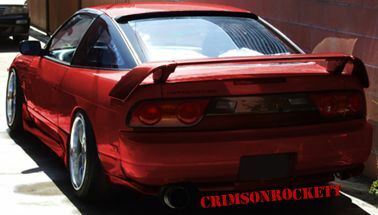 PBM Coilovers, S13 KA swap, S13 5-speed swap, ISR Catback exhaust, adjustable suspension bits, etc. Fully parting out the remainder bits from an S13 with a trashed exterior. Do you have an s13 fuel pump hanger/wiring in good shape? Currently have 4 fuel tanks with their original fuel pump assemblies. Would you be willing to sell just the assembly? Hi, what kind of driveshaft is that? I'm in search of an S14 ABS driveshaft. I currently have a non ABS installed and its crammed against the transmission since I have a Nismo LSD. Added Bride seats, wheels, and some other misc parts. I do need a new tank. Do any of them still have the baffle plate in it?